Less than 24 hours after a shooting at a Colorado movie theater claimed the lives of 12 people and injured dozens more, a conservative political action committee sent supporters an email using coverage of the event to push for donations. The Campaign to Defeat Barack Obama released a fundraising letter late Friday afternoon requesting donations over an early report on ABC News that suggested a member of a Colorado tea party group may have been the shooter. The on-air report, delivered by ABC News chief investigative correspondent Brian Ross on "Good Morning America," was inaccurate, and Ross issued an apology and a correction later that day. 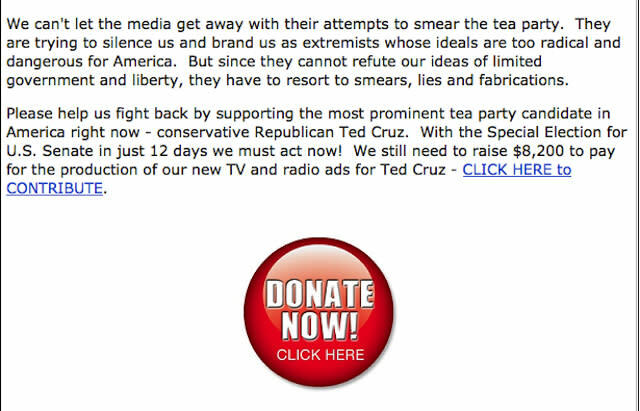 The fundraising letter, which was written on behalf of Texas Senate candidate Ted Cruz, asked for money to "fight back" against the media. 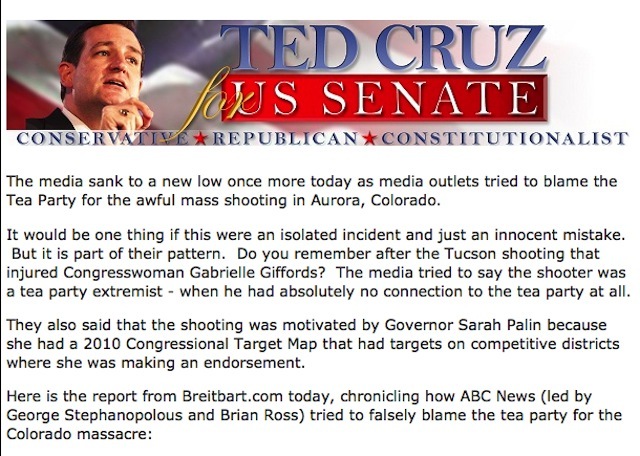 "We can't let the media get away with their attempts to smear the tea party," the unsigned letter read, including a link to a story about Ross' report from Breitbart.com. "They are trying to silence us and brand us as extremists whose ideals are too radical and dangerous for America. But since they cannot refute our ideas of limited government and liberty, they have to resort to smears, lies and fabrications. Please help us fight back by supporting the most prominent tea party candidate in America right now--conservative Republican Ted Cruz." The group is not affiliated with Cruz's official campaign.